Secretary-General Ban Ki-moon launches the 2012 MDG Report. With three important targets on poverty, slums and water having been met, a new United Nations report stresses the need for a true global partnership to achieve the remaining Millennium Development Goals (MDGs) by the 2015 deadline. 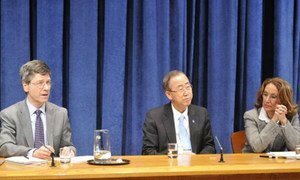 The 2012 MDG Report offers “the most comprehensive picture yet” on global progress towards the Goals, Secretary-General Ban Ki-moon said as he launched the report at the high-level segment of the annual session of the UN Economic and Social Council (ECOSOC). The report states that meeting the remaining targets, while challenging, is possible – but only if governments do not waiver from their commitments made over a decade ago. Further success depends on fulfilling MDG 8 – the global partnership for development, Mr. Ban notes in his foreword to the report. “The current economic crises besetting much of the developed world must not be allowed to decelerate or reverse the progress that has been made. Let us build on the successes we have achieved so far, and let us not relent until all the MDGs have been attained,” he said in the foreword. The 2012 report says that, for the first time since poverty trends began to be monitored, both the number of people living in extreme poverty and the poverty rates have fallen in every developing region, including sub-Saharan Africa, where rates are highest. Preliminary estimates indicate that in 2010, the share of people living on less than a $1.25 a day dropped to less than half of its 1990 value. This means that MDG 1 – cutting the extreme poverty rate to half its 1990 level – has been achieved at the global level, well ahead of 2015. The report notes that the target of halving the proportion of people without access to improved sources of drinking water by 2010 has been achieved. The proportion of people using improved water sources rose from 76 per cent in 1990 to 89 per cent in 2010. In addition, the share of urban residents in the developing world living in slums has declined from 39 per cent in 2000 to 33 per cent in 2012. More than 200 million have gained access to either improved water sources, improved sanitation facilities, or durable or less crowded housing. This achievement exceeds the target of significantly improving the lives of at least 100 million slum dwellers. The report also points out that the world has achieved another milestone: parity in primary education between girls and boys. Driven by national and international efforts, many more of the world’s children are enrolled in school at the primary level, especially since 2000. Girls have benefited the most. There were 97 girls enrolled per 100 boys in 2010 – up from 91 girls per 100 boys in 1999. The report says that enrolment rates of primary school age children have increased markedly in sub-Saharan Africa, from 58 to 76 per cent between 1999 and 2010. Also, at the end of 2010, 6.5 million people in developing regions were receiving antiretroviral therapy for HIV or AIDS, constituting the largest one-year increase ever. He noted that projections indicate that in 2015 more than 600 million people worldwide will still lack access to safe drinking water, almost one billion will be living on an income of less than $1.25 per day, mothers will continue to die needlessly in childbirth, and children will suffer and die from preventable diseases. The report warns that the 2015 deadline is fast approaching and in order to achieve outstanding goals, governments, the international community, civil society and the private sector need to intensify their contributions. “There is now an expectation around the world that sooner, rather than later, all these goals can and must be achieved. Leaders will be held to this high standard. Sectors such as government, business, academia and civil society, often known for working at cross-purposes, are learning how to collaborate on shared aspirations,” said the Under-Secretary-General for Economic and Social Affairs, Sha Zukang. Secretary-General Ban Ki-moon today stressed that focused financing and partnerships for development have resulted in great strides in the global efforts to combat extreme poverty and facilitate social development, noting that the number of impoverished people is declining across the world.